Kay Pearson loved music throughout her life, playing piano in music halls, theatre, dance halls and people’s homes. Kay Pearson at the piano. Her book was published in 1978 after a feature about her life in the Hull Daily Mail. She was asked to finish the book, people as tickled by her story as the ivories Kay played from childhood. A copy of Life In Hull From Then Till Now is a lucky find – the book is long out of print. Running your fingers over a blue leather cover the dips of a gold picture and white lettering are as precious as her memories. Opening the book the face of Kay Pearson looks back seated at a piano surrounded by friends. Kay’s story spans over 70 years of history from the turn of the 19th Century until the 1970s a time of enormous social change for women in Hull and the UK. It reads like someone sitting down at an old-fashioned typewriter talking out loud from start to finish. Her story is told without artifice, flourish or it seems that much editing and it’s good for it. For instance at the outbreak of the Boer War in 1899 the typeface changes as if the moment was a rift in time that could never be breached. Page 80 of the book. At the outbreak of the Boer War, the typeface mysteriously changes. Her life story is extraordinary but it’s the details of her life as a women that makes this book so fascinating. It holds brutal accounts of female life; cleaning The Article, evidently an essential part of post-birth kit in the early part of the 20th century turned her 14 year old stomach and ours as reader as well. Her story has many ups, downs, dips and turns charting the social history of women and changes the 20th century brought to her life. Her stories about clothing make for fascinating reading. Kay describes shopping, clothes, fabric and fashion in a way that reminds us that modern fashion is associated with consumerism, extravagance and luxury. In comparison with ‘then,’ the ‘now’ is easy, true poverty part of Kay’s life. Luckily her sisters were good needlewomen and helped her mother make a ‘new dress …in a delicate pink or grey,’ so that she could wear it with rag dolled hair for a childhood performance. In 1978 she was still using this dress as a costume it survived so well. We are left with this description to imagine the clothes she made. What of her own wardrobe? And her own wedding in 1915? Evening dress, ca. 1900-05. 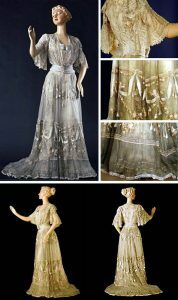 Made of Ninon fabric (sheer, delicate material, probably silk in this dress.) This dress is far out of Kay’s reach, made instead for the affluent upper classes. ‘Finances in our household were down to zero.. to obtain a bridal gown was out of the question, however, material was purchased at a store Willis and Co, on the corner of Waterhouse and Carr Lane. ‘My eldest sister concocted a dress and jacket for me and the left over pieces were made into two small head bonnets for the bridesmaids who were arrayed in white. A snapshot of time, throughout the book, illustrations and photos of Old Hull are interspersed with Kay’s story. She doesn’t include family occasions, instead choosing to show pictures often faded and hard to make out on the page. They are interspersed with snippets of programmes she took part in or produced and photos performing in her later years. Her daughter Betty is on the final page. Standing in her back garden she is dancing for her mother as the camera clicked. Holding the skirt of her dancing outfit it also has signs of being hand-made. Life In Hull From Then Till Now is a fascinating read for anyone interested in Hull’s social history through oral history telling. That’s a phrase that means collecting and studying history through recording people talking about the past. Kay started to write aged 81 and that’s exactly what oral history is all about – talking and writing it down. It’s part of the way the story of the House of Mirelle is told as well. Kay Pearson was a musician, mother and without knowing it an Oral Historian of Hull. ** ‘Costume’ in this context describes a skirt suit. *** ‘Ninon’ is an artificial fabric similar to Rayon.